After all the failed attempts by official channels, a few dedicated fans got together and made their own sequel to the series. And so, after eight long years of development, a small group known as Bombergames would finally release their tribute to the series, a testament to their hard work and their love of the games…Before Sega would demand its removal only a few days after its release. The exact reason for this reason isn’t known for sure, but most people assume it has to do with the digital releases of the older games. As the game had already been released, however, it found its way around the internet, although you’d have to poke through a shady file hosting service or two to actually dig it up. 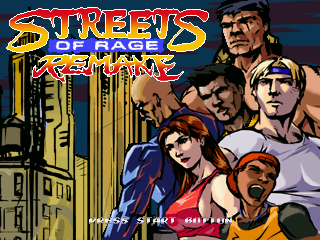 Eventually, Sega must have either changed their minds or have forgotten about the whole mess entirely, as the game is now freely available for download from the Streets of Rage fansite. The site also hosts a patch which will vastly increase the enjoyment of the game, fixing a few game-breaking bugs as well as balancing the previously brutal difficulty level. As the name implies, Remake is less of a new game than it is more of a blend of the original trilogy. There’s a good bit of new content in there, if you look, but for the most part, it’s basically the entire trilogy brought together into one game. There’s not really much of an obvious plot to Remake, aside from the fact that Mr. X is doing bad things and needs to go get punched a lot. Then again, anything too far beyond that just tends to complicate things, as Bare Knuckle 3 demonstrated, so a simple plot works just as well. While there are a plenty of cutscenes, done in the style of the third game, most of these boil down to the heroes seeing a bunch of bad guys to punch, and then going out to punch said bad guys. 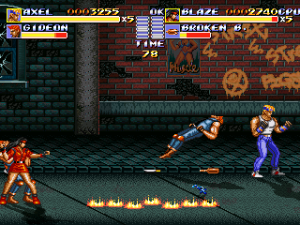 If you’re playing on the game’s default settings, the game plays exactly like Streets of Rage 3, with every character getting all the new features like dashing, Blitz attacks, and special weapon moves. Remake also reintroduces the police call special, now mapped to its own separate button. 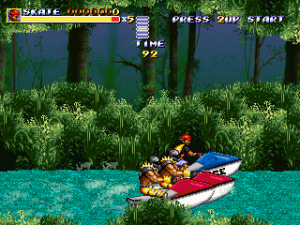 Once per life, you can press the “Police” button to send in your long forgotten backup, who flies in on a helicopter and takes a minigun to everything on the screen. Pretty brutal, sure, but very effective, and a lot of fun to watch. Unfortunately, the police call has a few more limitations this time around, as there are a lot of stages where it just won’t work. Usually, these are places where a helicopter wouldn’t logically fit in there, like inside buildings, but sometimes the game just won’t let you call the police because it says so. If you’re not content with SOR3’s mechanics, however, you’re given a lot of free reign to change them. In fact, there’s a ton of options letting you change the rules and features of the game around to cater it more towards your own favorite SOR, or even a mix of the three games, if you so desire. Sick of the weapon health gauge? 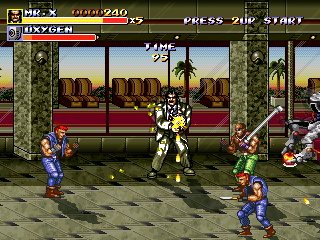 Switch your weapon type to the SOR2 setting and bash heads in to your heart’s content. Dashing, rolling, and the special meter not doing it for you? You can turn those off, as well. You’re even free to set the delay between hits in a character’s combo, if you’re picky enough. The game never penalizes you for enabling or disabling any of these options, so it’s best to pick between them until you’ve got something you’re personally comfortable with. From the start, you get six different characters to select from, gathered from across the entire series. Adam even makes his first appearance since the original SOR, and he even comes with a brand new set of moves to help him fit with the rest of the cast. The rest of the cast gets an upgrade, as well, with most of them getting new moves they can perform with or without weapons in hand. In terms of weapons, everything you could use on your opponents in the original games are here, although the beer bottles and salt shakers are sadly restricted to the SOR1 path. You can even find the occasional firearm, like uzis and bazookas, and while they aren’t incredibly common, they’re pretty fun to use. If something about the idea of the SOR folks using guns displeases you, however, you can disable their appearance at any time, leaving them in the hands of the bad guys. Once you’ve made your choice of character, you’re given a choice of four different routes to take through the game. Two of these are recreations of the first two games, where you go through mostly the same stages the original game would give you. 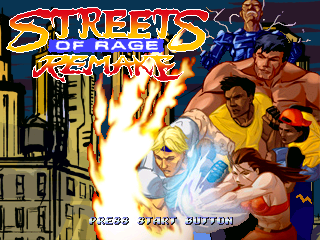 The third and fourth routes are a mix of a few stages of SOR3, along with a few new stages exclusive to this game. 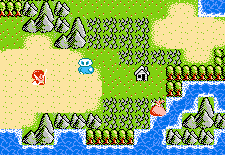 There are even a few points during the game where you’ll be offered a choice between different paths, some of which will take you down a separate route. 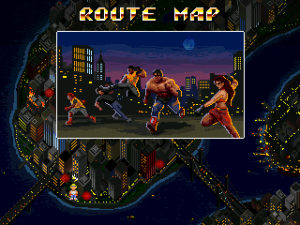 You can actually change routes multiple times, if you’re lucky, transferring from the first stage of Streets Of Rage 2, before ending up on a new set of stages entirely, with the option of continuing down your original path to finish the game. It’ll take quite a few playthroughs to see where every path leads, which gives you an incentive to keep playing. The SOR1 stages are fairly authentic remakes, although there have been a few changes in the places where they’ve needed it the most. 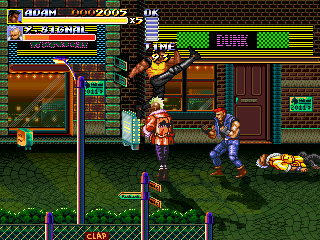 All the enemies that didn’t make the cut for SOR2 return here, like the dearly missed axe-juggling clowns. Even the enemies that lived to see the sequels are back to their old designs here, and they even have some of the old habits that made them so annoying to fight in the original game. The whip-wielding ladies still love to drop to their knees when you hit them enough, making them immune to all damage for a few moments. That’s not to say there’s not a few surprises, however. 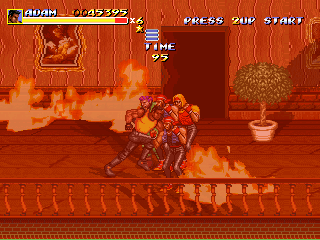 You’ll deal with the bikers from the later games from time to time, and you’ll even have another encounter with Shiva before entering the final stage. You’re even offered the same choice once you reach Mr. X himself, and with some of the characters you can play as once you hit this scene, the bad ending can be made absolutely hilarious with certain characters. While this route is vastly more fun to play through than the original game, it’s still one of the weaker paths, overall. The levels are still fairly bland, despite the best efforts of the developers, and while it’s fun to play through once, you’re better off trying the other routes after that. 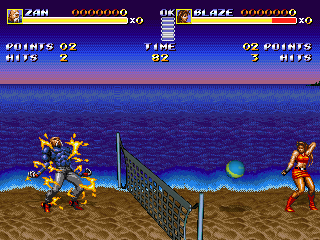 It is, however, probably the definitive way to play the original Streets of Rage, as all the new moves make the whole experience go by much more smoothly. The Streets of Rage 2 path doesn’t have quite as many changes if you stick to the standard path. If you explore a little, however, you’ll find a few alternate pathways leading to new areas. You can now go upstairs in the bar in Stage 1, where a random mook will set the place on fire, bringing you onto a fight on the rooftops. 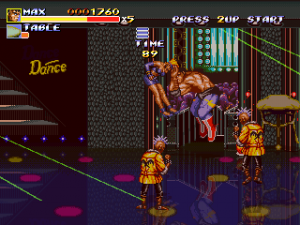 From here, you’ll end up in an entirely new stage where you fight on top and inside a subway train. The original routes have their own share of interesting stuff, as well, including a few stages where you ride a motorbike and jetski. These are a fun diversion where you ride around on a vehicle, smacking enemies that close in behind you, occasionally ramping over things to avoid obstacles. They’re not very long, but they add a little variety to things. There’s a few different endings, with the ones for the SOR1 and SOR2 paths being mostly based on their original endings. Certain routes will have Mr. X turn out to be the robotic duplicate from SOR3, who arms a bomb in his headquarters after you kill him. 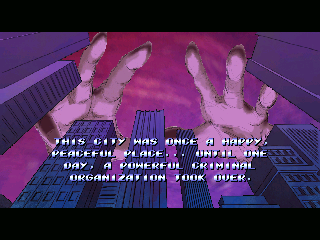 This starts a callback to Stage 6 of SOR3, where you have to search the Syndicate headquarters to find a keycard, disarm the bomb, and defeat Shiva under a pretty hefty time limit. If you don’t do things right, the city gets blown up, with the heroes included if you don’t escape in time. Even if you do everything right, the game will tell you to try another route. There is an ending you get for completing the game on Mania difficulty that seems like it’s the definitive ending… but then things get weird. 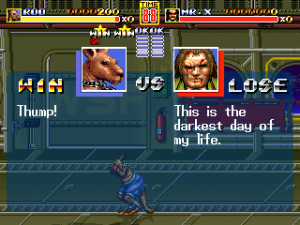 Overall, since the game generally takes all its features from SOR3, it’s just as well put together as the games that inspired it. There’s not really any new ideas in there, aside from a few new moves the characters can do, and the multiple routes and paths you can take to the end. But seeing as the original trilogy worked so well on its own, it’s a good thing that the team didn’t throw a lot of ideas to mix up the formula, and it leads to a product that works just as well as the old games. The difficulty’s pretty mild, as long as you make sure to have the patch installed, and the difficulty curve is generally comparable to Streets of Rage 2. The toughest points would have to be the SOR1 path, as there are a lot of pits you can end up getting tossed into that’ll cost you a life. If you’re unlucky enough to have a random Garcia knock you into one, there’s pretty much nothing you can do about it. 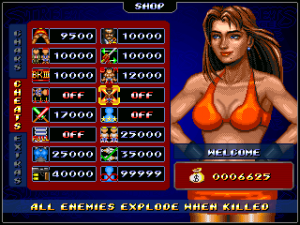 Each time you finish the game, it tallies up all the point items you’ve collected and gives you money to spend in the shop. There’s a lot of things to things to spend your hard earned gold bars and watches on, from secret characters, to cheats of varying helpfulness, along with a few bonus modes. The shop is apparently run by Blaze, and if you enter the shop during very late hours, you’ll actually catch her napping. While Blaze is asleep, there’s actually an atomically small chance you can grab one item from the shop without paying for it, but it’s truthfully never, ever worth it. If you fail, Blaze will wake up and scream at you, and then bar you from the shop until the next time you beat the game. And on the tiny, tiny chance you do grab it, you’ll be barred from the shop until you pay back what you owe her… which can take a very, very long time depending on what you stole. Crime doesn’t pay, kids. Besides, she’s a main character from this series, what did you think would happen? 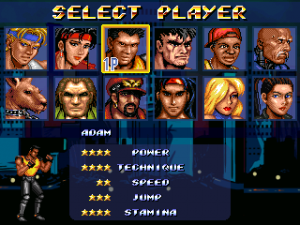 Among the secret characters are the hidden players from Bare Knuckle 3, including the ever fabulous Ash. This time around, all the hidden characters have full movesets, with the artists supply new sprites for when they didn’t exist for all the moves. Roo might not have thumbs, but he’s now capable of wrecking some havoc with a baseball bat by putting it in his mouth. Ash, on the other hand… well, he’s definitely interesting to play as, even if he’s a little difficult to be really good with. On the plus side, he has a screen clearing special all his own. Let’s just say he doesn’t need a helicopter and leave it at that. You can also unlock alternate versions of Axel, Blaze, and Skate based off of their SOR1 and SOR2 variants. While their SOR2 versions play exactly like you expect, the SOR1 versions have different stats and a couple of moves the other versions don’t have, which, while not very authentic, makes them interesting to play. There’s also a few other new characters, including a couple of villains and a female ninja named Rudra, who sadly seems to be firmly entrenched in that sort of fan-fictiony “original character” territory. Besides the standard story mode, there’s a few other modes that can be played with one or two players. The Battle mode is now joined with a Volleyball mode, where the characters use their attacks to keep the ball from landing on their side of the net. Much like the battle mode, it’s more of a distraction, but it’s a fun concept, at least. On the single player side of things, there’s a boss rush and survival mode, along with a mode that gives you twenty or so special missions to clear. There’s also a utility called “SORMaker” that can be unlocked, which lets you create and play fan-made sets of levels. Sadly, there’s no way to change the characters, enemies, or any gameplay features, so it’s a little limited. 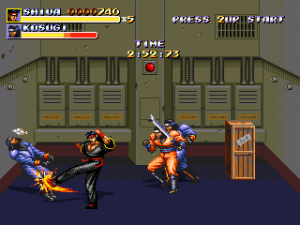 You can, however, download plenty of fan-made content, including an admirable attempt at remaking the Final Fight trilogy. One of the most requested features for a game like this, online play, is missing entirely, however. It’s understandable, given the time and effort something like that needs, but it’s still a shame. While most of the graphics have been kept mostly authentic to the original games, there have been a lot of parts where things have been touched up or redrawn entirely. This is most notable for the levels that you’ll see on the SOR1 path, which have been redone so that they’re a little more proportional to the characters, as well as having a little more visual detail to them. There’s also a few extra visual touches added in the old levels, like lighting effects and transparencies. It’s never a massive improvement, but it helps the game look a little more modern without messing too much with the original pixel art. The new stages look pretty good, as well, although they’ve got a more hand-painted look to them that means they clash a little with the older stages. The characters, however, tend to be a mixed bag. The new sprites every character gets look great, and fit in perfectly with their old ones. The newer characters, however, like Adam and Rudra, look good, but seem a little off, for lack of a better word, most likely the way they’re shaded. In another visual touch, enemies can actually be dismembered with bladed weapons, and they’ll bleed profusely if they get shot, stabbed, or slashed. It’s a little offputing, considering that you couldn’t ever bisect people in the original games, but in fairness, that’s just one more option you’re free to turn on or off. The soundtrack’s been redone entirely, with every song from the series having been redone. It’s all been redone with more modern synths compared to the Genesis hardware, but it all sounds pretty great. Overall, Remake is a fantastic tribute to the series and everything in it, and while it’s not always perfect, it’s definitely a professional piece of work. It manages to add enough new content to the older games that it stays interesting, while introducing enough of its own features that it’s still distinct from the games that inspired it. While the lack of online play hurts, it’s still definitely worth grabbing if you’ve enjoyed any of the classic trilogy at all.